Beginning Old Post: Since becoming a Nutritionist, I’ve vowed not to believe hearsay and research health claims for myself before accepting their validity. As I had often heard time and again how good green tea is for our health, I decided to research it for myself. However…the more I dug around for what I thought would be studies of overwhelming support, the more conflicting information I found, and less sure I became. Is the famed health drink a fallacy? Studies have (so far) not been able to prove a link between regular green tea consumption and a decreased risk for cardiovascular disease (CVD), and high blood pressure. 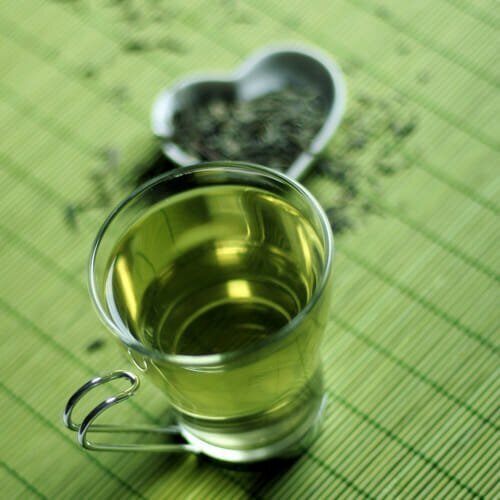 While some studies have recorded as much as a 40-50% decrease in markers for CVD, others have produced no correlation to green tea and a reduced risk. **See footnotes for references. From it’s chemical make up, we know green tea is chock full of flavonoids. Flavonoids have been witnessed to scavenge the body for free radicals. Free radicals are the nasty unstable molecules that de-stabilize other cells in your body in order to stabilize themselves. Selfish! This is why free radicals are often associated with premature aging. Polyphenols (the parent category to flavonoids), can also help promote the death of irregular cells and inhibit the growth of mutated cells (hence the benefits to cancer prevention). This suggests the potential for green tea to dramatically impact the health of our cells. So why have so many studies not been able to prove the positive connection? The common thread in the research suggests that there have been too many variables to accurately assess if green tea alone is the magic elixir. Variables such as tea quality, strength, and variety; and lifestyle factors such as diet, smoking and exercise have all been associated with affecting the results (favorably or not). This suggests we need to look at green tea in combination with other factors that could create some of the benefits we’ve believed in for so long. Often habitual tea drinkers will not be as dependent on coffee for stimulation, and may therefore have reduced stress on their adrenal glands. Stress of any kind produces excess of the hormone cortisol in the body, which promotes inflammation. Try: Swapping a few of your habitual coffee’s each week for a green tea (or even start with a green tea latte!). You can add a splash of 100% apple juice to lightly sweeten it. Green tea is anti microbial and anti viral and can help to improve your immunity and your intestinal flora balance, which benefits your nutrient absorption. Try: Incorporating green tea into your day as you would a multi vitamin! Green tea is the least processed tea leaf, being steamed rather than oxidized (as black tea is). Try: Making the swap if black tea is your stand by favorite, or bring green tea into rotation. Green tea also has the highest flavonoid content of all the teas (at 25-30%). Of the popular caffeinated beverages available, green tea is the least caffeinated. Green tea will therefore help hydrate you as opposed to use more water in its assimilation. Being hydrated improves your body’s natural inflammation response, boosts immunity and helps balance blood pressure. Try: counting a cup of green tea as part of your daily water intake and see if you end up drinking more water than usual in a day! Japanese culture uses traditional tea ceremonies as a means of practicing spiritual release, serenity, harmony and peace. There are even whole sections of homes, and yards devoted to serving tea, specifically to be able to use it as a form of meditation and unwind. It’s also traditionally used as a means to honor and respect guests. Try: Unwinding after a stressful with a green tea rather than a sweet treat. Share it with those you care about as a way to slow down and enjoy each others company. Let’s take a note from traditional societies and incorporate such a symbolic and vitality promoting ingredient into our own celebrations. Give the gift of tea; unwind with friends and family over tea; have a tea party to celebrate the holidays instead of a cocktail party (why not?! ); or use it in your holiday baking as a means to create some festive colors and get people talking about this dynamic ingredient…. Thanks for this one Emma! I’m glad to know that green tea can actually be seen as beneficial for the body. I have enjoyed it as a routine and will now be even more likely to choose it over the stand-by black tea, knowing it has these wonderful effects on the body. I’ll also push it on Sam (sshh) to help relieve some of that good old architecture stressing! Much love, hope you’re well! Ah it’s that time of year hey?! You’ve got to love the end of semester crunch. Almost there!